My skin is so incredibly sensitive and I am finding that anything that has any kind of cosmetics or cream that have chemicals in them causes me to breakout. 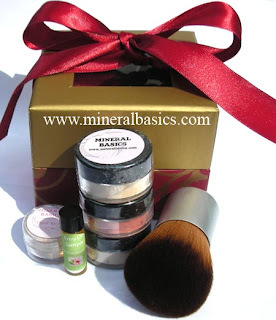 I am always on the lookout for natural makeup and so I was really pleased to discover the company Mineral Basics! 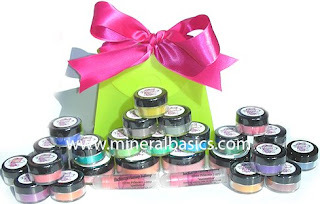 Chandi Plank is the creator of Mineral Basics which she started back in 2004. She had her own skin issues which are very similar to mine- acne and oily skin with dry flaky areas that caused her self-esteem issues. She loved mineral makeup but couldn’t find a foundation that suited her needs so she created her own! And so began Mineral Basics! So what is mineral makeup anyways? Mineral makeup is the healthiest and most natural form of makeup out there and contains no irritants, fillers or preservatives to aggravate your skin. It’s simply a blend of natural mica and minerals. It has been around for a very long time and actually, the Egyptians used it for face and body shimmer. 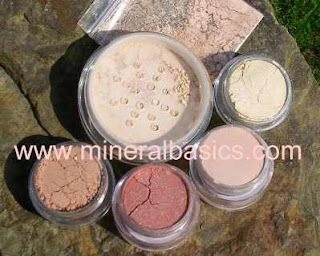 Mineral Basics offers a multitude of products including foundations, concealers, bronzers, lip products, skin care products to name a few. They also have really good prices! I had the opportunity to review the Try Me Mineral Make-up Mid Size Kit. It contains One Foundation Shade, Nectar (for your cheeks), Angel Kisses Finishing Powder, Complete Cover Concealer, Emu Oil, and a Silky Soft Kabuki Brush. It came all neatly wrapped in a gold and cranberry box with a pretty bow so it would make a great gift for someone. This was my first time using a mineral foundation and concealer and I have to say I am impressed. I love what it did to my complexion. It made it look so soft and natural like I wasn’t wearing a pound of makeup like I normally have to in order to cover up the multitude of imperfections on my face!! My skin tone was even and the colour was just right for me. The one I used was Light which is for light skin tones with just a hint of colour. I found the foundation blended easily and I did not need to use that much to create the desired effect. I also liked the Nectar which is for your cheeks. I used it as a blush and found that it was a really pretty tone against the foundation. The Angel Kisses Finishing Powder is one of my favourite products in the kit. Its a finisher that you dust on after you are done putting your makeup on and it offers a hint of shimmer. I have tried Emu Oil on other areas of my body, so this was the first time using it on my face. I know Emus have skin that is quite close to human skin so it is an extremely effective and natural moisturizer. The kit came with a vial of Emu Oil that is used as a moisturizer no matter what your skin type. I did really like it and found that it didn’t give me a greasy look. The price for the Try-Me Mineral Make-up Mid Size Kit is only $34.95 and to me that seems like a phenomenal price considering all that you get! I know I have paid much more than that for just a small tube of foundation!! It’s definitely well priced and just an all round awesome product! I’ve never tried this line before but I’ve tried mineral makeup and it looks really nice on my face and it’s good for my complexion too.